My "little brother" Judah just turned two. He is the love of my life and I am the love of his. No questions asked! Last week we got spoiled. We spent time together four days in a row! This week has been a bit stressful to say the least. Work obligations, social commitments, health issues, financial stresses… I was beginning to feel a bit overwhelmed and buried under the weight of it. My heart was rocked! I was ready to leave work, jump in my car and drive to wherever he was. I would be whatever he needed me to be - wherever he needed me to be it. The desperation of "Heatheyyyy" moved my heart to tears yet put a smile on my face to hear his sweet voice cry out for me. It was the most precious thing I've ever heard! It was days later as the pressure of the week mounted that I was able to see the spiritual parallel. If that little baby moved my heart when he screamed "Heatheyyy," how much more is the Father's heart moved when I cry out for Him? Confession: I haven't been doing much of that lately. I've grown frustrated with unchanging circumstances - prayers I don't see answers to. Unfortunately, I've been falling into the "I can do it myself" mindset. Just calling out the name Jesus and expecting Him to arrive in my circumstance and be the I Am was not on my list of things to do - Mainly because of my fleshly pride. 2 Chronicles 32 tells the story of King Sennacherib of Assyria and his plan to invade and destroy Judah. Upon hearing the plan of the impending siege against Jerusalem, King Hezekiah told his people Be strong and courageous, Do not be afraid or dismayed before the king of Assyria and all the horde that is with him, for there are more with us than with him. With him is an arm of flesh, but with us is the Lord our God, to help us and to fight our battles. The people were encouraged by the words of Hezekiah. What faith did that man have! Would I have been able to say that? Nope. But of course, when we lay our faith out on the line as King Hezekiah did, that's when the enemy likes to sneak in and rattle us even more. And that's exactly what happened. King Sennacherib began to blaspheme the God of Judah and Jerusalem. He mocked the people, their God and their king. He even went so far as writing hate-mail to them, mocking in writing all of their beliefs and trying to instill fear in the hearts and minds of the people. Cried out. In his position, knowing the ability of and history of the Assyrians, I imagine King Hezekiah was in a place of desperation. There was no way out - other than by the hand of God. He prayed and cried out. Two different actions. His faith and posture of prayer - crying out, desperate for intervention - solicited the favor of God. The Lord sent an angel who took out the Assyrian army. Did Hezekiah's cry for the Lord sound anything like Judah's cry for me? Luke 18:17 tells us that we must receive the kingdom of God like a child. Maybe it did… Maybe it was short and simple. Maybe it was just the name of the Lord. Maybe he was only capable of groans and tears. What do you do when a Sennacherib shows up in your life to taunt you, instill fear and mock the God you serve? Hezekiah could have tried to develop an amazing battle strategy. He could have figured out a plan of retreat or the details of surrender. He could have tried to escape and left his people vulnerable. But he let go of his own strength and laid it out before the Lord. He didn't just pray. He cried out. Was your heart moved by hearing my little brother's yell? How much more is your Heavenly Father's heart moved to run to you; to be what you need when you cry out for Him? So, my knees hit the floor and I cried out. Angrily at first, like Judah did. "God… where are you?" Then quietly and softly, "God, I need you." And a peace rushed over my heart. Did my circumstances magically change? No. But my heart did. You don't need to explain the situation to Him. He knows who/what your Sennacherib is. He already promised you and I He would fight for us and perfect all that concerns us. We just need to cry out. Void of pride, ultimatums, and fear. He will show up. He is moved by your voice. Before I explain my definitions, let me give you a recap. (I didn’t realize so many of you actually read this until you started asking why I haven’t posted in ages!) This month has been very busy! I was blessed to spend Christmas break on the Carnival Pride cruise ship with my best friend, Leslie. We both opted for something really different for the holiday and skipped heading home in exchange for the Bahamas. On Christmas Day we docked in Port Canaveral and headed to spend the day at Disney World’s Magic Kingdom. It.was.amazing. It’s been a dream of mine to be there on Christmas day and it far exceeded any expectations I might have had! The following morning we woke in Nassau and went to Atlantis to swim with dolphins. As if I haven’t totally made you jealous, we ended our fun in Freeport snorkeling off a catamaran. Our time on the boat was so special. The trip was healing and empowering for both of us. We met amazing people who have become dear friends and were able to be lights on what we both agree was a very dark boat. Let me just say, the people who sail at Christmas are the ones who don’t celebrate the holiday. But of course, the parents weren’t going to let me skip out on the holidays all together! So straight off the boat and onto a plane, I found myself in Roswell hours later. Lots of laughter and family game nights led up to the ringing in of 2014. I loved being home with my family – especially with my new sister-in-love! Note: one week on a cruise ship stopped in the Bahamas, one week in the desert. I returned to Pennsylvania with a wind chill of -36 degrees. I strongly questioned my life and why God thought that would be funny. 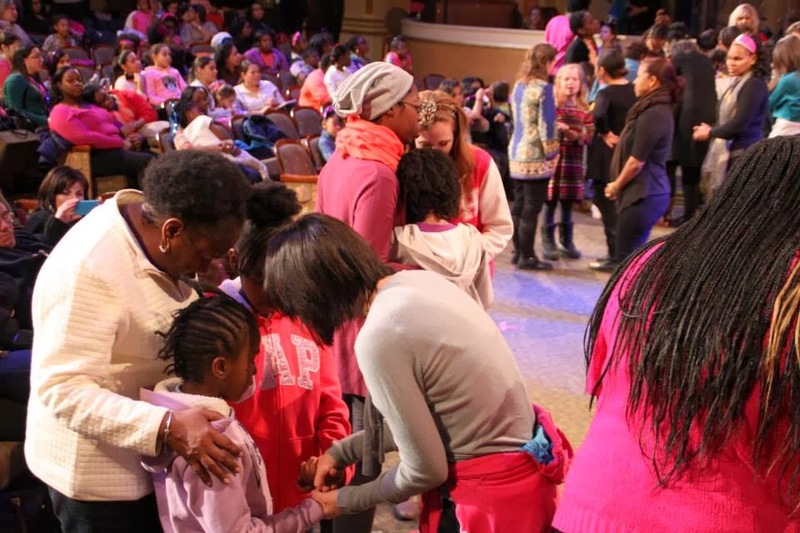 Only days later we packed up and took Secret Keeper Girl to the Brooklyn Tabernacle for a free outreach event. Over 600 moms and daughters attended. Forty-four girls and moms made first-time decisions to follow Christ that night. It was such a beautiful time of ministry. Now I’m taking a big, deep breath from this marathon month and settling back into the routine of work, teaching and helping Jackson puppy cope with the never-ending snow. For those readers here on the East Coast, this won’t have quite the same meaning to you. Friends from home – you will understand me. I come from the land of sunshine, warmth, heat, dryness. I moved to State College (which is only second to Seattle in terms of dreary days). It’s not uncommon to go weeks at a time during the winter and not see the sun or even blue sky for that matter. It’s grey – every day. It’s cold – every day. As in, we’ve been in the negatives for weeks and forecasters say we won’t be above freezing again until well into February. Seasonal affective disorder is real, and I have it. My mood is bad… I’m grumpy. My hip is stiff. The dog tracks snow and mud through the house. I get to scrape my car free of ice and snow far more than I ever desire to. I have the privilege of dragging the trashcan to the curb in six inches of snow. Shoveling the driveway is not one of my favorite pastimes. And I complain. Every day I complain. It doesn’t matter if I’m just talking to the steering wheel. I have something to say about how much I dislike this place – this cold- the snow. (For native New Mexicans this is especially cold and shocking). Living in the desert, I’ve never experienced “the four seasons” before. We have hot and cool. Out here I find myself seeking for – praying for – anxiously awaiting spring. When will there be warmth again? Life again? I wonder daily how much longer this could possibly go on. Solomon got it right in Ecclesiastes when he suggests, “There is a season for everything.” Who hasn’t experienced a winter in their lifetime? It’s that season when it’s cold, uncomfortable, dark, dangerous. When you wonder if life will ever come again. If things will ever change. I’ve been in a long spell of winter. The last six years have just been especially challenging. The loss of four loved ones, two surgeries, a broken heart, family health issues, moving… As soon as one “snow storm” passed another was in it’s wake ready to dump more upon the already frozen ground of my heart. And suddenly, one day you see it. Poking up out of the snow. A tiny sign of life. Of the beauty that is to come. Its beauty is inconceivable as it is contrasted with the bleak, lifelessness of its surroundings. I was given a bouquet of tulips recently. They were colorful and stunning and brightened up my kitchen table. Did you know that tulips require vernalization to bloom? That means the bulbs need to be exposed to a prolonged period of cold before they will flower. Many types of tulips can even be "forced" into blooming by placing them in a cold place for two weeks - aka your refrigerator. 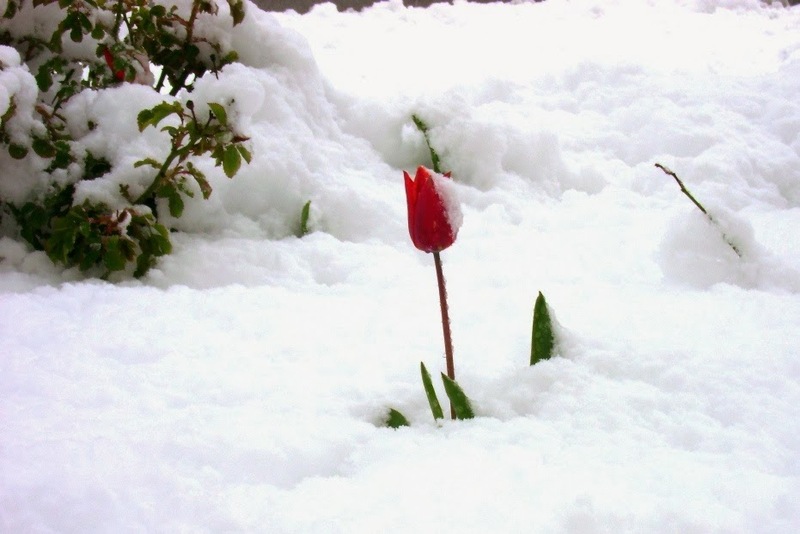 Because of their ability (necessity) to withstand cold, tulips are one of the first flowers that bloom each spring. Has it been winter for a long time in your heart and soul? It has been for me. I’m ready to bloom again. The cold is necessary to make me ready – rather than despise the process or complain about the surroundings, I can wait patiently as the Master Gardner prepares to wake up my heart. The rocket tore a tunnel through the sky. Everybody cheered. I am determined to rise out of the winter. The cold is only the beginning of my growth. Your heart will awaken again, love again, laugh again. After a long, cold, dark winter, the hope that a tulip places in one’s heart is beyond words. Don’t become a snowman. Let God bring you up through the snow. In the Jewish marketplace, sparrows were basically the cheapest thing you could buy. “Two for a penny” in today’s currency. They had little value. Sparrows were sold in twos. Their little legs were tied together with a piece of string or twine and given to the customer “two for one.” Most commonly, people would purchase four at a time. If the shopkeeper really wanted to make a raving fan and secure future transactions, he would sometimes throw in a fifth bird – FREE. Five birds – two pennies. While the sparrows had little value as it was, the fifth had none. He came free. Jesus’ language in this passage would have caught the disciples’ attention. 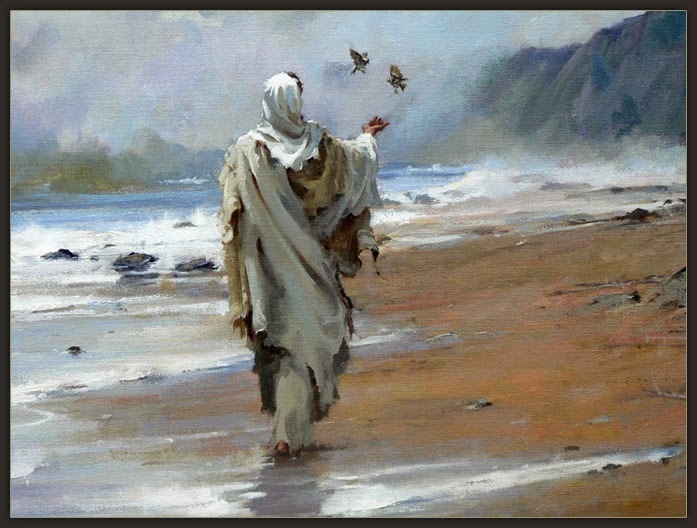 The fifth sparrow – the free one – even he mattered? Yes. Number five was not forgotten. You may feel undervalued – not appreciated – taken for granted – used. You will not stay in this season of winter forever. You will not be forgotten. Your Father sees you and values you more than you could even begin to comprehend. You will bloom again and when you do, you will put Solomon and his splendor to shame. Dare to let the Gardener draw you out of this winter. You're not dead. Maybe dormant, but if you have air provided by the Creator of the Universe in the lungs He gave you, you're not dead. You are seen. You’re noticed. You’re valued. You are deeply loved. Now live.